[utl]http://www.youtube.com/watch?v=Dmy9eyYo1cY[/url] video captured from composite-modded ZX-81. after reading up on the capabilities of the machine, I think this looks pretty okay. still I have the feeling more is possible. piggy for now. eh eh ! Good job Shadow ! 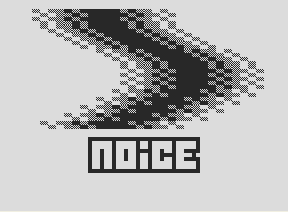 thats quite a nice logo for zx81, almost made me forget the blocks. Maybe too simple. But, being a 512b for ZX81, I think that this little thing deserves my thumb up. Special thump for this limited platform! Maybe there is more in the future? After reading up on the hardware I have to thumb this up. A slow Z80 which also drives the display leaving only 25% of the CPU free for code. Knowing the limitations, it's okay. demos on obscure platforms rock! Noice: btw, without additional RAMpack connected You can use 256/192 resolution, guys, You don't have to rely on chunks. Anyway I hope that's not the last one Your prog on ZX-81. limited or not, this looks a bit too simple for me..
Grey / MSB: I had ZX81 with me on previous Atari party but YOU were NOT there. Scandalous. Xeron: well, every platfom has its standard, and on ZX81 it's a machine + 16K (original from Sinclair or Timex of course, not "handmade" :) ). But when You connect it, You lose possibility to draw in high resolution (like in this one http://pouet.net/prod.php?which=19210 ). ZX81, my first computer, ahh, memories! [looked the youtube] great work!! !